One year ago today, I was experiencing the beginning of my first hurricane. And it was a big one. Hurricane Irma was the strongest storm on record to exist in the open Atlantic region. It was projected to be a Category 5 hurricane, the highest on the storm scale when it made landfall in the Caribbean. For a week, we watched as it grew larger, stronger and moved westward on a path headed directly for us on the island of Antigua. Having previously lived all my life in the landlocked Western United States, I had no idea what to expect during a hurricane. I talked to neighbors and friends. I read from government hurricane preparedness pamphlets and attentively checked the news channels. I watched in dismay as Hurricane Harvey flooded Houston and video animations showed the damage a category 5 storm could cause. Tropical storm and hurricane watches and warnings were issued. Many Americans in Antigua booked flights off the island. But for our family of 7, the price was exorbitant and so, like the majority of the islanders, we did our best to prepare and weather through the storm. When a massive force of nature is staring you down, you realize how little control you have over anything. It is at once both terrifying and awe-inspiring. In the days leading up to predicted landfall, the island was abuzz with preparations. Trimming trees, picking all fruit off trees, clearing debris, boarding up windows. We did all we could to prepare and to minimize the risk to ourselves and our property. We prayerfully considered whether to weather the storm at home or in another shelter. Every day we made preparations, yet I never felt prepared. Every day the satellite prediction images showed the storm inching closer and closer. Our family and friends back in the States were worried about us. They prayed for us and frequently checked in. Island neighbors gave us tips on how to protect our belongings, what foods and supplies to stock up on. Their eyes held a look of horror when they recalled the devastation caused by the last major hurricane to directly hit Antigua, in the 90’s, rendering many without electricity for 2 months afterward. We busied ourselves preparing as best as we could, getting as much as possible off the floors and wrapped in plastic preparing for the onslaught of water that everyone said accompanied hurricanes. We boarded up windows, tightly closed windows and doors and stuffed towels around them to help absorb the water. Irma was expected to pass over us in the early morning hours of Wednesday, Sept 6, 2017, with winds and rains beginning in the late afternoon of Tuesday, Sept 5. Governments issued warnings not to be outside after 9 pm and that they would cut the power (to lessen the risk of electrical accidents) island-wide as the storm intensified. We felt best about sheltering at our church during the hurricane so in the early afternoon on Tuesday, we loaded up our car with non-perishable food, a change of clothing, blankets, pillows, some toys and games to help pass the time, and many, many gallons of water, and headed out. I wondered what state our home would be in the next time we saw it. Clouds were gathering and the winds had already started. When we arrived at our church building, we learned of several church members who wanted to shelter there but had no transportation to get there. My husband made several trips out with our van to help bring others to the church building, including our dear friends with their 3-day old baby. The kids started playing with their friends. As the winds picked up and rains began, we settled in for a long night. 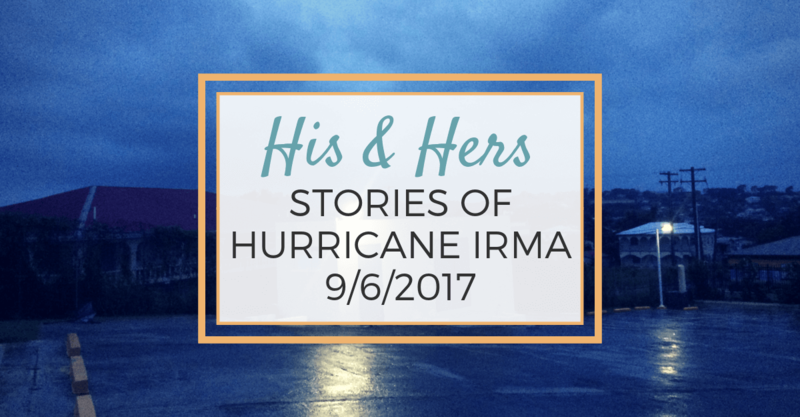 A few days later, after it was all over, my sister in law asked my husband and me via text “What was it like to go through a hurricane?” These are our experiences, his and hers. Honestly, it was a great deal of waiting and watching and worrying. There’s so little that you can control. We had to move everything in our house a foot off the floor and cover things in plastic. Because last time a hurricane hit, the neighbors had 18″ of water come in. And that was just a category 3 hurricane. It was like packing up to move. You grocery shop because it takes two weeks after a hurricane before food ships get back here. You stock up on things you can eat if the power is off for a long period of time. You shop for food every day. You check the storm prediction websites every day when you wake up and the purple cone of terror (the path of the storm) is creeping closer and closer to you. You check multiple times a day. You worry. You pray. And pray. But it is headed right for you. And it’s the 2nd biggest storm in history. You’ve seen the video footage from other hurricanes. And it’s awful. And you’re scared. But trying to have faith, not fear. The dreaded day arrives. Hurricane’s coming and you go to the place you think is safest. But you really don’t know because there are so many unknown factors. You can’t control a single thing. Not one single thing. Then the wind starts and it gets worse and worse and worse. There’s some rain. The whole city goes black except for the few lucky ones with the right type of generator. Which thankfully our church had. After sandwiches for dinner, you get ready for bed. The last scripture you read before turning the lights out says “because of the prayers of the righteous, they were spared.” It gives you some peace because so many friends and family from home have said they are praying for you. There’s a time set by the government when all people should be indoors and sheltering. Your husband goes out into the storm after that to keep two ladies from walking to try to help an old man who’s just had a stroke. You pray fervently for his safe return. He’s gone for what feels like a very long time. He comes back safely, mission accomplished. Your whole family manages to fall asleep, thanks to noise-canceling headphones on the easily excitable 8-year-old. They miraculously all sleep through the night. Except for your teenage daughter, who stays awake the whole night listening to an audiobook she can’t put down. She doesn’t really hear the storm because of her earphones and said book. You can’t sleep because of the howling winds and the fear that the windows aren’t going to hold or the roof is going to blow off. And because you’re laying on a tile floor with 1 blanket under you and only a sheet over you. You packed for sweltering heat thinking there would be no power, thus no AC, fans or airflow, so you’re in your most lightweight pajamas. But there is power, and the AC is cranked up and you are FREEZING because you gave the blankets to your kids and the people who came in off the street. And the thermostat is in someone else’s room. You put a towel over you like a blanket. And your son’s sweatshirt on your feet trying to get warm. You pray like you’ve never prayed in your life. You stare at the ceiling tiles and wonder about them falling on your family. You sleep a little. And wake up every time the wind howls differently and shakes the roof or the rain pounds. You pray a lot. You check your kids to see if they are ok and have enough blankets. You are so grateful they are sleeping peacefully and not awake and terrified. You look outside. You can’t see much because it’s dark and there’s a fence. You can see the flood puddles outside on the ground. They are getting wider and deeper. You hope the walls can keep it out. Because you just saw footage of Texas and Hurricane Harvey and all the flooding. You worry about objects outside flying through the air. That your car will be smashed to bits. You worry you might have to make a run for it at some point so you get up and put a bra back on and your phone in a plastic bag and your eyeglasses right next to your head. The wind blows and blows and blows. For hours and hours. And it rains and rains and rains. For hours and hours. When it gets light enough, you see no significant differences outside except it’s really wet and the trees have fewer leaves and the light outside is dangling precariously above your car. Someone went out in the night and tied it to a post so it wouldn’t fall onto your car. You see more rain falling than you’ve ever seen. The winds are blowing the opposite direction from when you last went outside. You are so relieved you survived the night. Then your husband wakes up and says “that wasn’t so bad.” Turns out he slept through the whole thing. The younger kids think we just had the coolest church slumber party ever. You feel so relieved. You pack up your carload of gear. You drive home slowly. There are billboards blown over, downed tree limbs and a lot of leaves in the roads. But the buildings look ok.
You worry about what your house will look like. Surprisingly, it looks the same. You wonder how much water got in. A few of the towels you stuffed by windows and doors are wet. There are puddles in your laundry room, your bed, your daughter’s bed, and your husband’s bedside table. You mop up the water. The generator is running. You feel for the first time that the higher rent you pay for having a generator is worth it. You put some fans on. You feel very grateful and yet let down all at once. All the hype. And the worry. All the preparations seem a little unnecessary. But you know they weren’t because…What If?!!!? It could have turned out so differently. You worry about your friends. Are they ok? Are their houses ok? You can’t really find out because no one has power. One by one reports trickle in. And they are all ok. You feel so grateful. And bone weary tired now that the adrenaline is wearing off. You hear there’s another hurricane coming in a few days. You leave everything packed up and in plastic. Except you set up the tv and wifi router. You marvel that you have working wifi. Because on a normal day you hardly have working wifi. The kids find their screens. You go upstairs and take a nap on your wet bed in your clothes and sleep so soundly that you could be dead, but you aren’t quite because you just can’t go on a minute longer. And then you wake up and check the forecast out of habit. And that dreaded purple cone is headed your way again. And you see the news and the utter devastation others suffered just mere miles away from you. And you’re just so grateful and dumbfounded. It could have been us. It could have so easily been us. And you pray and pray and pray. Prayers of gratitude because you know the Lord sheltered and protected you. It was actually like a normal day in Idaho 😊. It was just really windy. So windy that your heart races constantly and you fear for your life and the lives of your family. You get to help lots of people from the church and from the streets find shelter and then feed them food and give them your blankets so that they stay warm, but your wife ends up freezing at night because she no longer has a warm blanket, but she never complains. Then you get to drive on the scary windy streets after the storm starts because some stranger who recently had a stroke and is paralyzed on one side is making distress calls to a woman at the church who hardly speaks any English asking for help. After you get back from the scary drive you finally get to lay down and go to sleep. You are scared until you fall asleep and then you wake up and the scary wind has slowed down. You then have really sore hips for two days from sleeping on the cold hard tile floor. You find out that you slept most of the night, but your wife was up with a scared child while she herself was scared. Then you feel awful that you snored through the storm while your wife was up scared and cold. You go outside and the wind is blowing in the opposite direction than it was when you went to bed. You look around and there are lights hanging from the church that blew off during the night and there are lots of trees and fences blown over. Then it starts to rain like you have never seen before and it rains and rains and rains. You eat well because your awesome wife packed good food for at least a three-day stay plus extra because you don’t know who else is going to need food. Then after it calms down you get to take several people back to their homes from the church on multiple trips driving through obstacle courses created by fallen debris. Then you get home and find out that you get to do it all over again in three days because there is another hurricane coming. Then you find out your sister island was destroyed and you spend the next couple of days working on ways to help them. Then you get a huge relief when you find out the second storm is not going to hit your island and the weather turns out to be much better than a normal day in Idaho. The Hurricane season of 2017 was utterly devastating for many of the Caribbean islands. As reports of the terrible chaos and destruction spread, the world was moved with compassion. Donations, prayers, and aid were made readily available. Antigua’s sister island, Barbuda, was completely devastated, rendered uninhabitable, and everyone had to evacuate to Antigua. I stopped by the relief center as Antiguans prepared to receive the Barbudan refugees. My heart was warmed by the number of donated goods and people gathering to help and serve, all of which had been assembled within a few hours notice. I watched as the first boatload of Barbudans arrived, bone weary, traumatized and with very few personal belongings. Food, clothing, and shelter awaited them. They were enveloped by kindness and compassion. I was struck anew with the overwhelming conviction that people are good. People are loving. And love is more powerful than every storm. Like, Share or Pin this post.